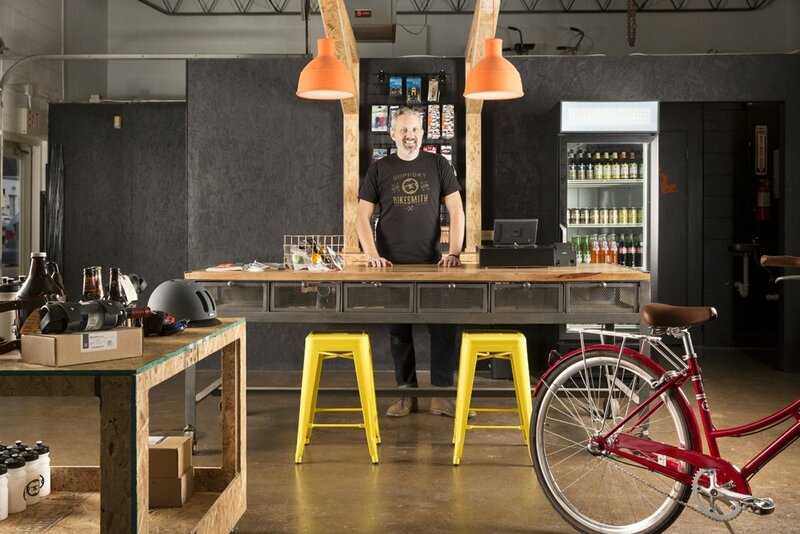 The Bikesmith is a colorful bike repair and retail shop serving beer with a large outdoor event space and pump track. The building is a former auto garage in a neighborhood experiencing revitalization. Challenge: on a shoestring budget, reimagine an auto garage as a fun, family-friendly bike space. The client had an existing mobile bike repair business which uses a large box truck. Their success warranted an expansion into a brick and mortar shop with retail. The space was freshly painted and cleaned up but there were no designated spaces other than a cramped entry, small office and one restroom. The front façade was painted in a large scale, black and white checkered board pattern which would have been expensive to change. An asset to the space was a very large fenced in yard which had great potential but had only housed broken down vehicles for some time. We laid out the floor plan to create a generous entry and corridor to the office and restroom. The floor plan provided a cash wrap area, tables for hanging out, retail display and the workshop. We also designed the backyard area adding a patio, shade canopies and string lights. Orange and yellow accents brightened the trim of the façade. Playful elements such as yellow painted bikes were mounted to the front of the building. Inside, keeping with the garage concept, materials and textures are used that you would find in a workshop. A large scale custom mural was printed on peg board and serves as a back drop for the entire space. Modern, colorful lighting brighten the space and custom mobile platforms display bikes and merchandise.